How do we know? That’s what investors told us in 2009 after the global crisis wiped out an incredible $64 TRILLION of investor wealth globally. We had warned about the global crisis. 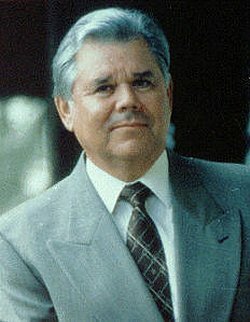 In fact, Bert Dohmen, founder of Dohmen Strategies, wrote a book in 2007, Prelude To Meltdown, predicting that an immense global credit markets crisis would occur in late 2008. Not only was this right on target, it also was right on the timing. In fact, our advice to buy specific inverse ETFs allowed investors to make some incredible profits during the crash. We now see similar global conditions in the credit markets as we saw in 2007-2008. The credit markets are much bigger and much more important than the world’s stock markets because that’s where the danger emanates. But Wall Street analysts never talk about it. Turmoil in the credit markets is a much more important factor in predicting market plunges. It involves many TRILLIONS of dollars instead of millions when talking about companies. A warning signal: Emerging markets equities and debt are once again being hyped as a great investment, just as in 2008 before they lost 67% of their value according to the emerging markets ETF (EEM). The story is always the same false one: emerging markets have higher growth rates and have higher yields on debt. 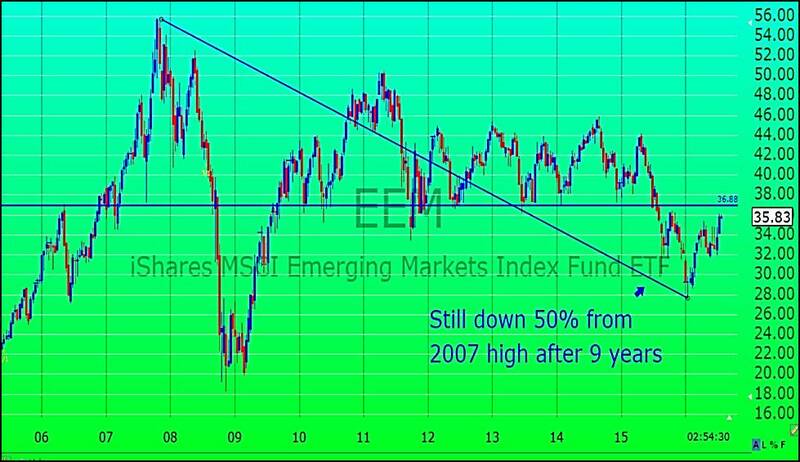 They never adjust these numbers by “risk.” Look at this chart of the Emerging Markets ETF. Wall Street doesn’t tell you that the emerging markets are now piling new debt on top of the old debt, in order to pay the interest on the old debt. Much of the debt is dollar-denominated, while their own currencies are plunging. That makes the dollar debt very difficult to service. Do you remember all the hype about Brazil and predictions of prosperity forever. In fact, it was the “B” in the term BRIC, which was used for allegedly the top emerging markets. Here is what happened after Wall Street analysts got done with their hype: Brazil suffered an 82% crash! We are already seeing the warning signals from the emerging markets. Venezuela, which has one of the largest oil reserves in the world, is in chaos. It should be prospering based on its oil. People have nothing to eat and are raiding trucks with food. Inflation is around 700%. The socialist government blames it on business owners. Now the problems of another oil-rich country, Nigeria, are surfacing. Economic growth has just gone into the recession area, but the central bank has hiked interest rates again to slow inflation. That’s the old, false theory that higher interest rates attract foreign capital and slow inflation. Actually, higher rates do the opposite. Nigeria will eventually go the way of Venezuela. Look at the plunge of 74% the past two years of the Nigerian stock market, just after analysts hyped the oil-rich country. What do the emerging markets bulls think will happen to the economies of emerging countries that have no oil? How will they service their debt? At a big conference in July, where Dohmen was a speaker, a show of hands of over 2000 people revealed that the majority was bullish on the stock market. That is a big, negative signal as the majority is always wrong at important turns. Most investors and money managers go by their emotions: they buy at tops and sell at bottoms. It’s difficult to make money that way. We believe it is with our revolutionary HEDGEFOLIOS membership service. You won’t find anything like HEDGEFOLIOS anywhere else. You are the only one who has access to your account. You don’t send your money to a stranger. It is not a managed account. You have the choice of replicating your own portfolio with the exact positions held in our model portfolios, which is instantly done by a simple click of your mouse. Our analysis is used to make portfolio changes when the indicators signal that a change might be appropriate. You receive an instant email notification, and then decide if you want to make the same changes. It’s that simple. No calculations, no entering separate orders for each position, and the rebalancing is done automatically. If you don’t won’t to wake up in the middle of the night worrying about what a stranger may be doing with your money, you should look into our exciting HEDGEFOLIOS membership program. HedgeFolios is especially designed to outperform the major market indices during market plunges and crashes. If you are worried about the markets and the economies over the next years, wouldn’t such a program be appealing? Now, for a limited time, you can save 15% with the brand new Gold Quarterly Membership for those who wish to try the HedgeFolios program on a shorter-term basis. Now you can gain the many advantages HedgeFolios has to offer your investment strategy, which is performing exceptionally well in this extremely fragile market. It’s not too late to join. Don’t make the mistake of sitting on current losses until they turn to giant losses. That’s what most investors do, and it can be devastating to your portfolio. HedgeFolios is ideal for investors who want to be worry-free during tumultuous market action, when most investors are incredibly disappointed and confused with the performance of their own portfolio. This program will let you sleep at night, whether markets rise or plunge. Join us today! We are always happy to speak with prospective members about the program and how it can give you an advantage in the market. P.S. Right now, we have a “LIMITED TIME OFFER” to all new members with our two plans, the Platinum Annual Membership (a 25% savings) and the brand new Gold Quarterly Membership (a 15% savings).